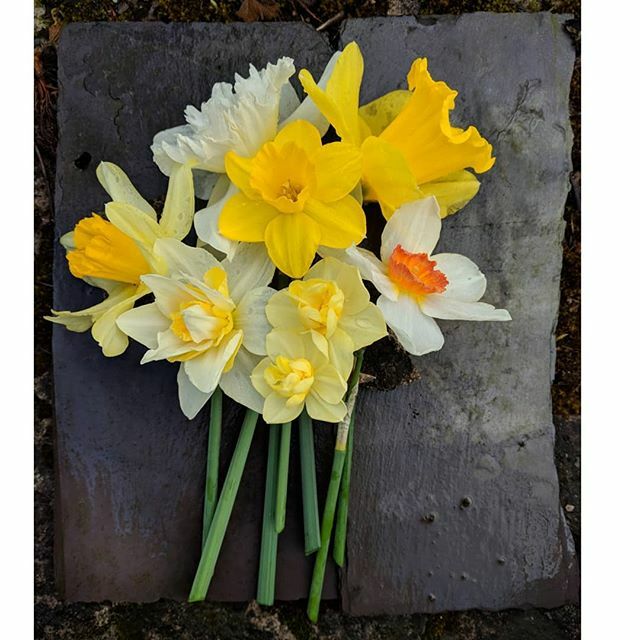 A quick collection of the daffodil varieties in our garden. I love the range of sizes and colours. Previous Post My May nature board and look at those colours! The board is beginning to get a little crowded… Going clockwise from the top left: Pieris japonica Baby wasp nest Ivy leaves and fruit Tulip with neighbouring tiny friend Laurel leaves Forget-me-nots (for absent four-legged friends) Apple blossoms Daffodil (might be Cheerfulness Duo variety) with tiny friend Apparently I need to check for stowaways more carefully! Thanks 🙂 now I’m curious why you don’t like Daffodils though? We interrupt the photo feed to bring you this message. RowanFalar on The tortoise is winning! Rowan on We interrupt the photo feed to bring you this message. Rosemary Gaynor on We interrupt the photo feed to bring you this message.